It’s taken me a while to get around to posting this – mostly because I had such a hard time thinking about all of the questions that I wanted to ask. BUT here it is…finally! 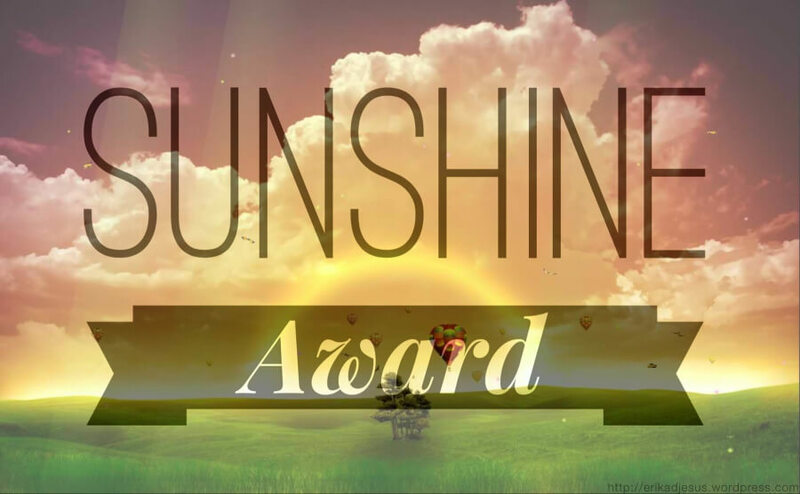 Anyway, I’d like to thank Amber from Wild Heart Reviews for nominating me for the Sunshine Blogger Award. Many thanks Amber! 😀 Stop by her blog if you haven’t already. She mostly posts books reviews. I personally love her Random Thursdays series, so check her out! – Answer the questions from your nominators. – Nominate eleven other bloggers and give them eleven questions. Hands down, Christmas! There’s nothing quite like spending quality time with the family, walking around the city that’s all decked out in christmas lights, and christmas decorations. Even the hustle and bustle of shoppers at malls during that season gets me really excited and happy. 3. If you could rename yourself, what would you change your name to? If I could change my name, I’d want a more unique one. Maybe a unisex name or even a straight-up boy’s name. 4. What are the three most used applications on your phone? 5. What are three random facts about yourself? I don’t know how to ride a bike. I’ve tried to learn multiple times as an adult, but I’ve never quite gotten it. I’m a crazy dog person. I’d want to pet every single dog I come across. 6. What is your astrological sign? 7. In reference to question #6, do you think astro signs predict anything about a persons personality? I don’t believe in astrology, but I do sometimes read the horoscope section just for fun. 8. Do you have a favorite genre of music? It’s so hard to pick just one! I like various kinds of music depending on the mood I’m in. Sometimes I like to listen to indie rock/indie pop, sometimes it’s rock, and other times I like to blast metal. It really varies, but for the most part, I stick with those genres. 9. What do you like about blogging? My favorite part about blogging is connecting with other bloggers, commenting on their blog posts, getting engaged into conversations, etc. Hands down, tea. I have a newfound appreciation for green tea. Coffee has too much caffeine. It gives me palpitations when I drink it. I also feel a bit guilty when I drink coffee, because I can’t drink it black. I usually have to add 3 teaspoons of sugar and quite a bit of milk/cream to make it drinkable. Tea, on the other hand, I can drink on its own. 11. If you were going on a long trip, to an unknown destination, and you could only take -one- thing with you, what would it be? I’m going to copy Amber’s question here and ask…what are three random facts about yourself? If you could travel to anywhere in the world right now, where would you go? And what would you do? If you could pick one thing that you could be good at, what would it be? Congrats on the award and thank you for the nomination:) your answers to the questions were so fun to read and I love your quote lol Love your questions, too:) You’re awesome!! I loved your replies, doll! 😀 I’m with you on the tea vs. coffee… partially because I’ve recently been forced to give up all things sugar. Bleh. And the quote.. whyyy is that so familar? Hrrm, I’ll need to think on it. Thanks Amber 🙂 I had a lot of fun answering all your questions, especially #1. Just talking about Christmas is already getting me excited lol. You’re welcome! You have such fun blog posts. I’m sure your answers to my questions will be equally as interesting 🙂 Can’t wait to read them! Oh thank you so much that means a lot! There are so many great bloggers out there including yourself and my blog seems paltry in comparison. 😀 ❤ I'll get to your questions real soon and I hope you find them interesting enough! Oh you make me blush!